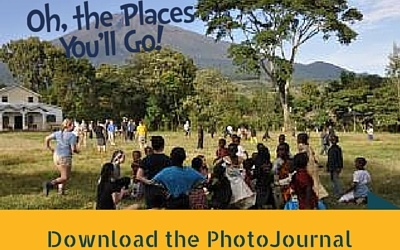 KES was very pleased to offer a new and exciting travel opportunity for our students this year. 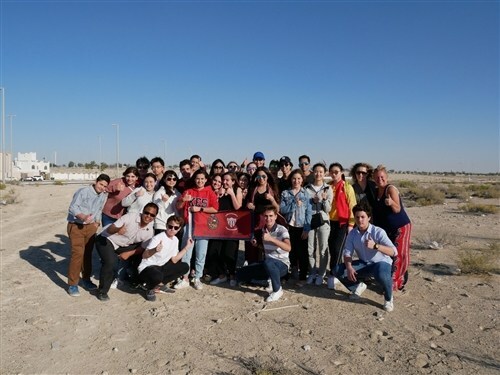 Twenty-five students and four chaperones had the incredible privilege of visiting the United Arab Emirates during our recent March break. This amazing venture to the Middle East was a first for KES. Our group enjoyed perfect spring weather as we explored Dubai, Abu Dhabi and Al Ain. March is one of the best times to visit the UAE. Winter has just ended, and the days are warmer but not too hot! We enjoyed the hustle and bustle of Dubai, taking in the iconic Burj Khalifa, exploring old residential Dubai, bartering in the gold and spice souqs, and of course, lavish shopping in the famous Dubai Mall. Let’s not forget the food – it was divine. From lean, grilled meats, to flavourful hummus, fresh tabbouleh and fattoush, and warm Arabic bread. Everything was delicious! Ms. Stewart and I raved about an incredible bowl of hummus that we ate – perfectly smooth with spicy chicken shawarma and pomegranate on top. Just amazing! Take me back! The great times continued with a desert safari where we enjoyed a fast-paced and thrilling ride over the desert sand dunes. As some of us learned, it is not for those with sensitive stomachs! Ha! Our students enjoyed a sunset camel ride and feasted on a delicious barbeque in the middle of the desert, away from the sights and sounds of the city. As if that wasn’t enough, we were treated to a traditional belly dance performance. Our trip continued with many more exciting activities including a visit to Abu Dhabi and Ferrari World where we all rode the world’s fastest roller coaster! We also loved our time at the Aquaventure Water Park where we could lounge at the pool or beach or speed down a water slide and into a tank of sharks! While not part of our itinerary for this trip, we were able to do a photo stop at the new Louvre Abu Dhabi. The gallery is very new, with limited pieces so far, but it was amazing to even see the incredible architecture and design of the outside structure. We also spent a quiet day in Al Ain, a community that has remained more traditional. It was really cool to see where His Royal Highness, Sheikh Zayed bin Sultan Al Nahyan, the founder of the UAE, had lived in his earlier days. We were able to explore his property and envision what life must have been like. The UAE, a relatively young nation, has developed and changed so much and so quickly that it is almost unbelievable to picture the old days. This year marks the 100th anniversary of Sheikh Zayed’s birth, and the nation still celebrates this man, although he passed away in 2004. It is very clear to see that he was a kind and compassionate leader who was well-loved by both local Emiratis and working immigrants. His picture and legacy is seen and felt literally everywhere in the country. Another highlight of our trip was when we visited the falcon hospital in Abu Dhabi. Imagine a place where falcons, the national animal of the UAE, each enjoy their own private, air-conditioned suites. We were really lucky to witness a small day-surgery procedure and to understand the great care and pride that locals have for these animals. Many falcons have passports and their own seats in first-class when they travel with their owners. It is just unreal! After we visited the falcon hospital, we were able to enjoy the majestic Grand Mosque of Abu Dhabi. The structure is breathtaking, made of gold, marble, mother of pearl, crystals and glass. At 1.5 billion USD, it was privately funded by Sheikh Zayed before his death. A significant photo stop on our trip was to a large sand pit, of all places. A large empty lot, full of sand and weeds. Maybe not super exciting to look at right now, but really neat to think about what it will be in the near future. This sandpit is the site of our new King’s-Edgehill School in Abu Dhabi! We made history in being the first students and teachers to step foot on campus. It was a cool experience and we got a great photo that will be remembered for years. A common trend that we noticed during our time is that the UAE spares no expense to create the latest, greatest, and biggest of everything! Seriously. They are building a Dubai Eye to be bigger and better than the wheel found in London. They are building a new ‘Royal’ Atlantis hotel, because the existing magnificent structure is just not good enough. There is a new tower under construction to exceed the Burj Khalifa by 100 meters. You really have to be there, and see all of this, to really believe it! While we were continually in awe of everything around us, I think our experience was also humbling in some ways. Life in the UAE may seem artificial, and in many ways, it is. It can be easy to be swept up in the glitz and glamour of Dubai, but we must remember the very real struggles, poverty and tragedy that does exist in spaces not so far away. We must strive to continually take action, or in-action in some cases, to change our thinking and behaviors. We need to do more and learn to know differently. But, it is so much fun to let go and enjoy a taste of Dubai for just a little while. The greatest comment that I heard throughout the trip was that the UAE was not what people had expected. Everyone was just blown away by what the country had to offer. Hearing these comments made me feel warm and so happy. The UAE has been a special part of my life for many years, and I know firsthand how the experience and opportunities can change your life. I’m so glad that our students and chaperones had a small taste of that, and that they too could start to know differently. Families, thank you so much for providing your children with the opportunity to attend our amazing trip. It would not have been possible without your generosity, and your trust in me!